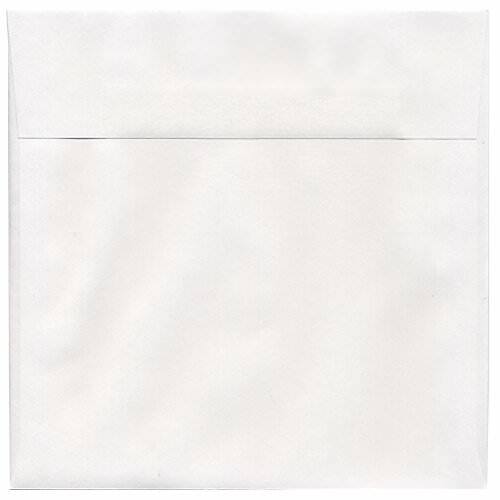 Would you have 7.5 x 7.5 White Classic Linen Solar White envelope need to price approx. 750 can I get a price today? For specific inquiries, call our customer service line: 201-567-6666! Thanks! Give your invite some flair with a square! Four corners of nothing but style, when you choose a square envelope, you know you'll get the attention your content deserves. These aren't just square. These are your classic white! Combine the two to make an amazing White 7 1/2 x 7 1/2 Envelope! A natural white exterior is professional and distinguished, a perfect choice for any occasion. From red holiday cards, to black invitations for your black tie event, even lime green summer barbecue invites! These squares will match with anything thanks to the white cover. White 7.5 x 7.5 Envelopes are available in three different styles: White, White Vellum Translucent, and Natural White Wove (100 lb). So go super classic with our white choice, give your guests a little hint before they open what's inside with our translucent envelope, or go super fancy with our Natural White Wove choice. You can buy these envelopes individually for that special someone or get a bulk for that big event!